I'll try to explain what happens in simple terms. Firstly, the way that analogue TV works is that the camera scans across the subject to make up a picture consisting of 625 lines, one below the next. It does this 25 times each second so during every second the transmitter sends 25 pictures to your TV set. Why go to all this trouble? Well, doing it this way means that there are lots of times when the transmitter is not doing anything because the picture hasn't changed since the last frame scan. This "spare" time can be used to transmit picture information for a completely different TV programme. In fact it is possible to "multiplex" (mix together) picture information from up to ten different programmes and send them on the same transmitter at the same time. The Digital Decoder is able to sort out the programme that you have selected to watch and to ignore all the others. 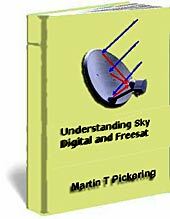 You'll find a more comprehensive explanation in our FREE book "Understanding Sky Digital TV". Click on the "Books" link, above. The advantage is that the broadcaster can use one expensive transmitter to transmit up to ten different programmes simultaneously, whereas with analogue TV it would require ten transmitters. The result is that it becomes much cheaper to broadcast each programme and, because it's cheaper and because there's room for many more programmes, the number of programmes and the choice can be increased quite dramatically. In practice, not more than 6 programmes will share one transmitter but this still gives six times as many programmes for you to watch. And because each programme costs less to broadcast, it becomes possible for low-budget productions to be seen. For example, we might get "niche market" broadcasts which concentrate on a particular hobby (train spotting, woodwork, pottery) or a particular religion or technical subject (for example heart surgery, transplant operations). In addition, if a telephone connection is used, you can take advantage of "interactive" items such as taking part in games shows, booking a holiday or an evening out, browsing the Internet and countless other things not even dreamed of. Digital is an "all or nothing" technology. The pictures are either crystal clear or absent. In heavy rain or snow an analogue signal might give a grainy but watchable picture. Digital signals are more robust and will tolerate a high level of interference but, when conditions become too bad, both the picture and the sound will vanish. In addition, because all the work is done by an internal computer, it sometimes makes mistakes and the picture can disappear in a maze of coloured squares or simply "freeze" on the screen. However, this "trade off" between pictures which might always be grainy and crystal-clear pictures which occasionally disappear will be preferable to most people. This information is given in good faith, based on the Sky subscription contract and information from other sources. No responsibility will be accepted for errors or omissions. It's up tou you to check the facts.